Consistency Is The Ability To Hate To Stop Regardless Of The Circumstances. It Is The Force Of Continuity And The Capability To Develop Inner Energy To Be On The Go. Consistent Says If You Don’t Stop Nobody Can Stop You. You See Yourself On The Stop Line Because You Decided To Be There. 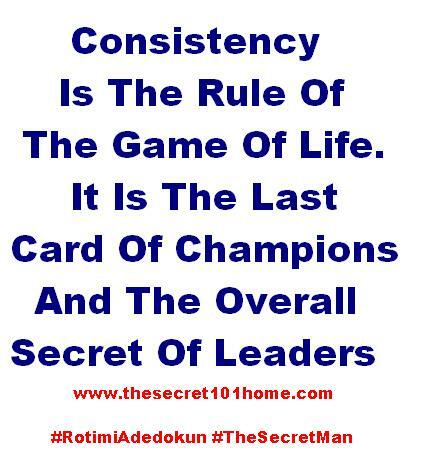 Consistency Is The Rule Of The Game Of Life. It Is The Last Card Of Champions And The Overall Secret Of Leaders. Decision Is The Brother Of Consistency, Addition Is His Sister, Hard-work Is His Neighbor, Action Is His Father And Purpose Carry Consistency For Nine Months. This entry was posted in Life and Time Management, Spirituality, The Peace, The Secret, Vitamin Of The Mind, You! and tagged Bishop David Oyedepo, Consistency Is The Rule Of The Game Of Life, Jim Rohn, Pastor E A Adeboye, The Law Of Consistency, The Power Of Consistent. Bookmark the permalink.